The Advanced series hoist systems are designed for manhole and confined space entry / retrieval applications. These units are constructed of lightweight materials including high-strength aluminum. The davit pivots for ease-of-rescue and has adjustment for overhead clearance restrictions. The lower base adjusts to fit most standard entries. Many other portable and fixed bases are available to suit any jobsite need. Lower mast extensions are available when additional height is required. When it comes to confined space entry / rescue, it is essential that equipment operates perfectly and quickly. DBI Sala has an extensive line of rescue and retrieval systems with decades of proven field service. Safety engineers and site directors trust DBI Sala for the type of high quality, rugged systems that will ensure top performance when it is needed the most. 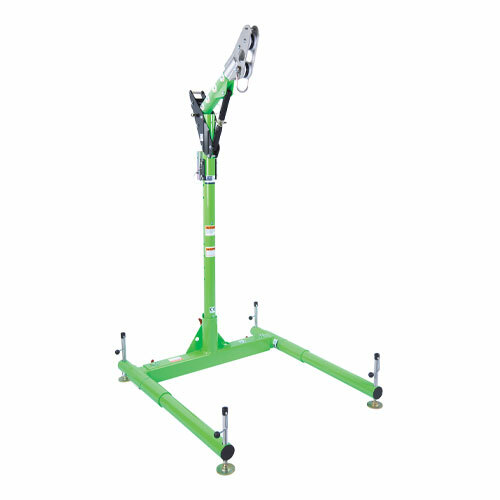 Telescoping reach of 11.5" - 27.5", and adjustable vertical height from 33" - 43"
* Winch and SRL sold separately.